Camel Pawn Shop Fine Jewelry pride ourselves on providing fair and honest offers for your unloved gold jewelry or if you need to sell to raise quick cash. Camel Pawn will also make sure and alert you if your gold has any antique value that would bring you more value than its meltdown value. Sell Your Gold today to a top rated gold buyer. 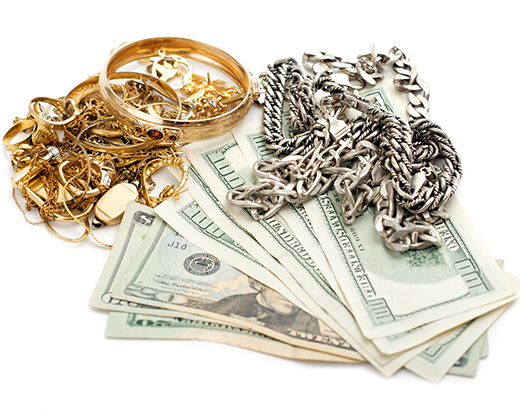 Get the most for your gold and turn your unwanted gold jewelry into cash. Camel Pawn Shop Fine Jewelry is Winston=Salems' diamond buyers, gold buyers and jewelry buyers. We have been buying and selling diamond gold jewelry for over 80 years and Camel Pawn has an A+ BBB rating. Camel Pawn Shop Fine Jewelry buys gold jewelry, rings, necklaces, bracelets, gold coins, bullion and scrap gold.